This is the park next to where I live, the Praire des Filtres. More of the Praire des Filtres, with Pont Neuf in the background. Praire des Filtres, looking in the other direction. Praire des Filtres, again. I quite like this park. The marks on the grass are caused by the table-tennis tables which were there earlier during the summer. Praire des Filtres, getting ready for the planting next season. From Praire des Filtres, the easiest way to get to the centre of Toulouse is to take the Pont Neuf. To the left you see the Hôtel Dieu St-Jacques. One of the classical roads to St-Jacques-de-Compostelle passes here, or Santiago de Compostela. Pont Neuf again. This photo is taken from the bridge south of Pont Neuf, the much less elegant Pont St Michel. This is what Pont Neuf looks like in the evening. Meta-photo of exhibition along the quay-side. Of course, walking along the river-side like everyone else can get a bit boring. Why not climb on the wall instead? Dome de la Grave reflecting in the river. Seagulls like the river too. The yelloy buoys are usually used by the people rowing or on water skis. Photo from taken from Pont Neuf, looking towards the city centre. Visible here is Les Jacobins (left) and the church Notre Dame de la Daurade (right) and the departure point for the river cruises. The convent of the Jacobins. And no, these Jacobins had nothing to do with the French Revolution. Photo from the same location, several hours later. 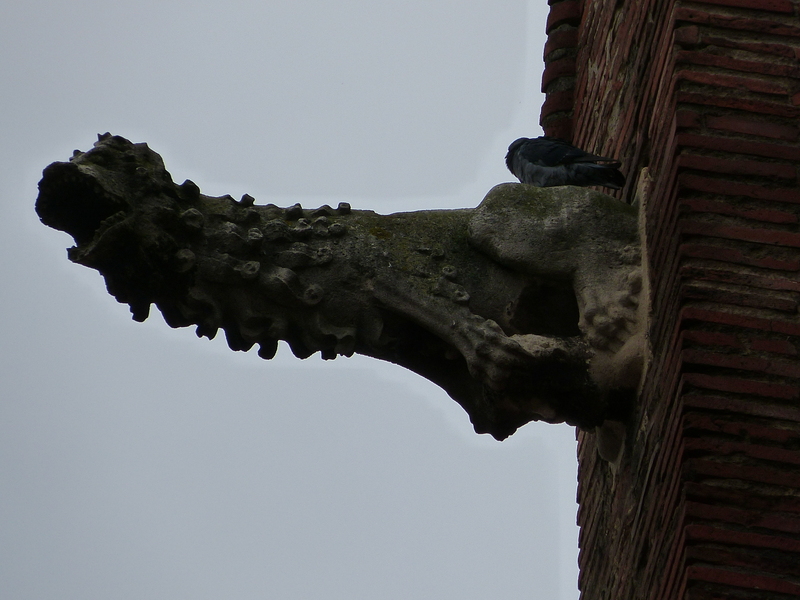 The gargoyles on the roof of the jacobin monastery. This is my best photo from how Les Jacobins looks on the inside. A a bike outside the nearby Lycée Pierre de Fermat. The Saturday morning organic vegetable market on the Place du Capitole. And such a beautiful car passing by too. Saturday morning, the part of the place du Capitole not dedicated to the market. See if you can spot the McDonalds. The Capitole building by night. Place Wilson, with fountain and carousel. A seasonal image of a tree somewhere in the middle of Allées Jean Jaurès. Aerial view of the biggest round-about in Toulouse, the Grand Rond. Actually the name refers to the park inside, but there is no need to be overly pedantic. A pigeon taking a stroll in the Grand Rond. Jardin des Plantes. Statue of someone and someone's old bike. Jardin des Plantes, autumnal version and someone who just finished her running. A bird house in the Jardin des Plantes. Ducks in a small river, inside Jardin des Plantes. Again beautiful atumn colours. This time just outside the natural history museum. Anyone knows what these birds are? The Chateau d'Eau. Once the place for the communal water pumps. These days it's a museum for photography. And this is it for this time. Nighty, night everyone.